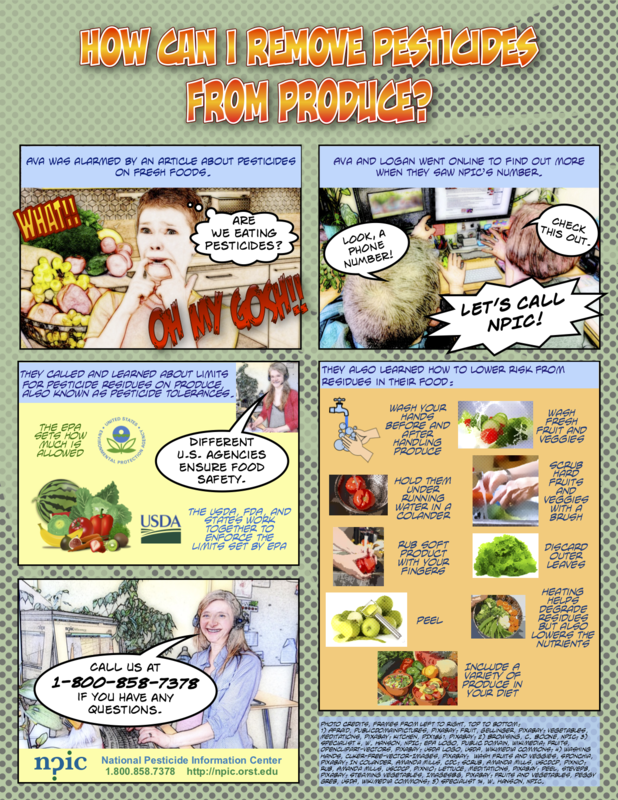 You are here: NPIC Home Page Frequently Asked Questions How can I wash pesticides from fruit and veggies? No method is 100% effective. As a rule of thumb, washing with water reduces dirt, germs, and pesticide residues remaining on fresh fruit and vegetable surfaces. Washing and rubbing produce under running water is better than dunking it. Wash fruits and vegetables from the farmers' market, your home garden, and the grocery store. Produce may have dirt, germs, and pesticide residues on them during the time it is grown until it's taken to your table. The Food and Drug Administration (FDA), US Department of Agriculture (USDA), and Environmental Protection Agency (EPA) control the amount of pesticide residue allowed on foods to ensure food safety. Any pesticide residue on fruits and veggies must comply with the regulations. The residue limits set by EPA are known as tolerances. EPA works to ensure a 'reasonable certainty of no harm' to infants, children, and adults from eating small amounts of pesticides in food. According to the FDA, eating a variety of fruits and vegetables is important for a healthy diet. All of the following options can reduce the risk of pesticide exposure. Fruits and vegetables have pores like your skin does. Soap products can get trapped in the pores. There are some kinds of soaps designed to be used on produce, but they are no more effective than water alone. How can I remove pesticides from fruits and vegetables?